It’s always fun to see what’s up with Desiree at Chic Coastal Living. I have had a little tropical vacation after a visit to her blog. This is from her post on Colorful and Beachy – Absolutely Beautiful Things. Ummmm! 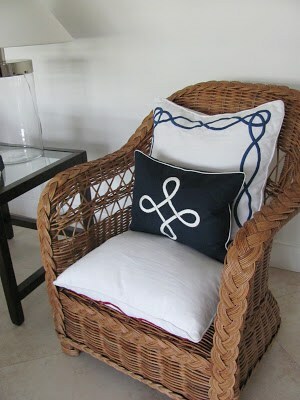 I love pillows and would usually plan a whole room around one delightful little coastal pillow! Pillows make a room cozy and add lots of warmth. Do you have a sterile room in your home? Guess what you need some pillows! Not just one, but a few in mixed sizes, shapes and colors. I’ve gathered some images that all have pillow gorgeousness! Ahhhh! Here are some pillows I had recently…..in had, I meant, I’m moving onto another look. I just wanted to share with you, that I do love pillows. Life….I mean, design wouldn’t be the same with out them! Now, let’s explore some design inspiration all centered around pillows! This room below shouts beachy chic all the way. Look at those gorgeous pillows in the window seat. Great idea! 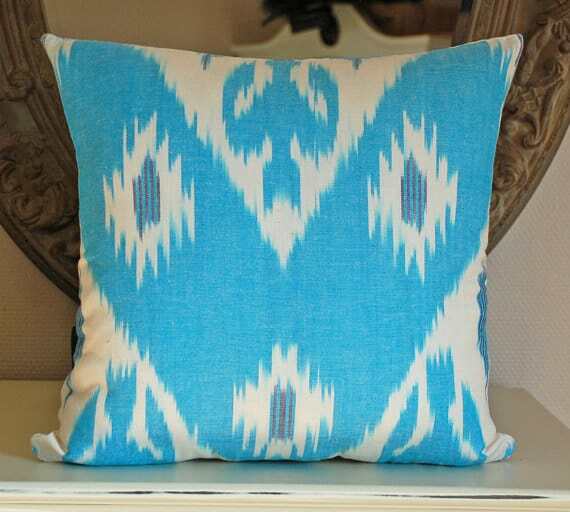 The pillows are covered in John Robshaw prints and Lee Jofa Ikat. Here’s more John Robshaw pillows to love! in a different refreshing way! The designer continued to have fun and also added multicolored pillows on the living room sectional. Love the bright pops of color on this beach house sectional! Tie dye and ikat! Gotta love it! 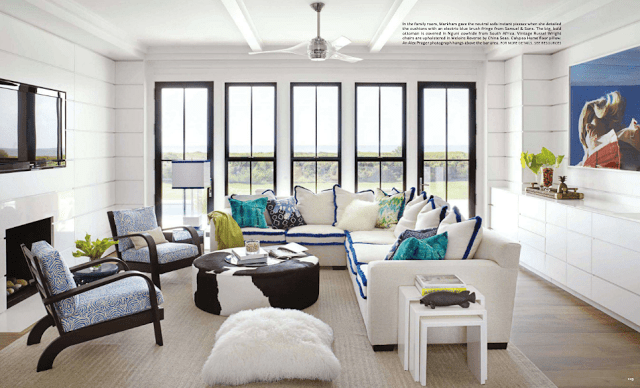 Tracery Interiors designed this room with a California surfer chic design in mind. I love the bright pop of color in the pillows covers! Bright coastal sea-side pillow love! 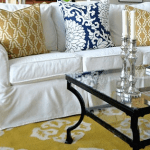 Beautiful way to dress up a large white sectional! These pillows are my favorite! Bright stripes! Who says all beach houses have to be bright? 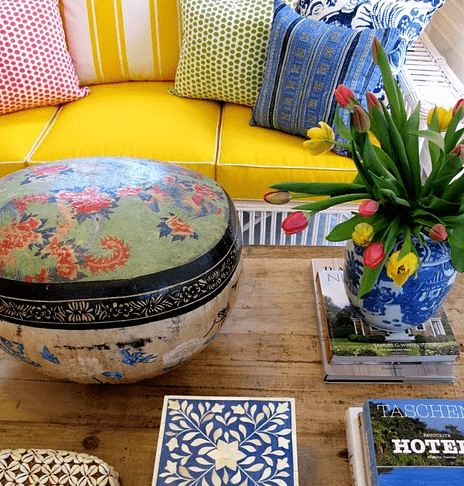 These pillows brighten up the gray sofas just enough. Love these simple one colored pillows for a chic beach house look. Perfect look for all year round! Boho Beach Pillows ~ What I love about this type of design is that it’s super easy and laid back and so much fun! This collection of colors are nautical and timeless. Here’s an Etsy beauty! The color is what I call, perfect! 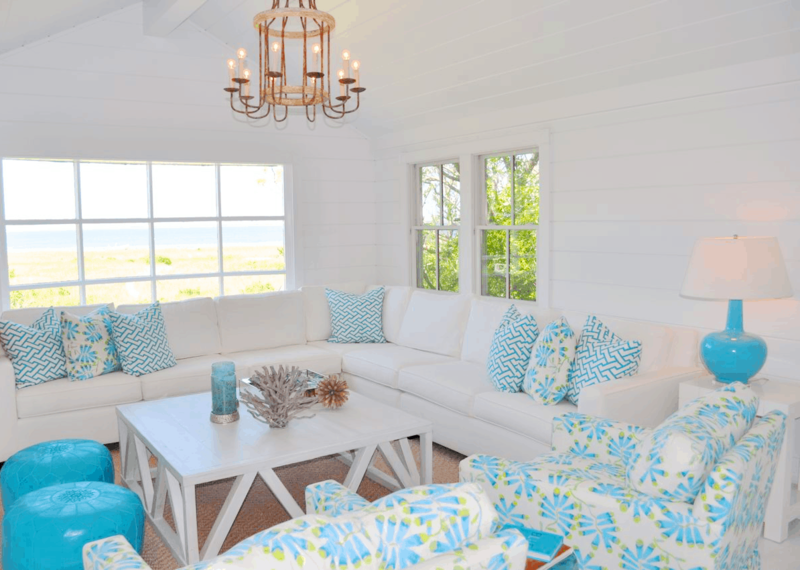 COCOCOZY‘s Beach house pillows are simply beautiful! Check these out! Loving the West Elm Modern Beach House Pillows! These pillows from Restoration Hardware are delicious! Did I just say delicious? I can go on and on for days about pillows! I guess, I’m addicted to pillows! Hope you enjoyed my coastal style pillow round up and thank you Mary Ann for having me! Desiree, you are a shameless Pillow Addict! You might even top me. Thank you! 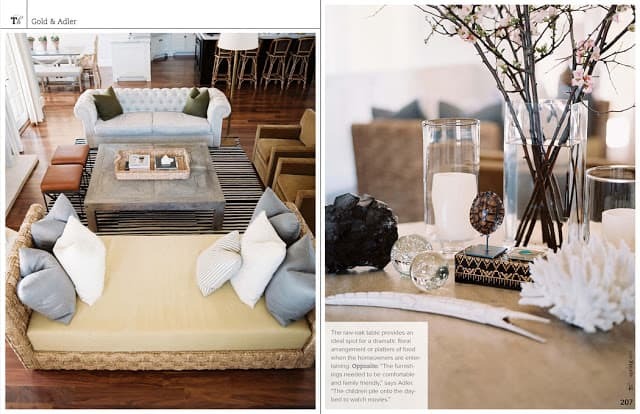 Check out Chic Coastal Living. 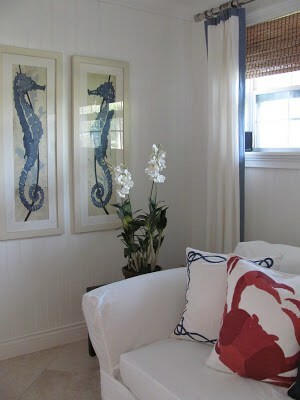 Love those seahorse prints on the wall! And the pillows too! Love the pillows! I also love the metal table! You can never have enough pillows, right?!! There was a recent episode on The Marriage Ref where the husband complained bc he had to move 21 pillows to get into bed every night!!! Great post. 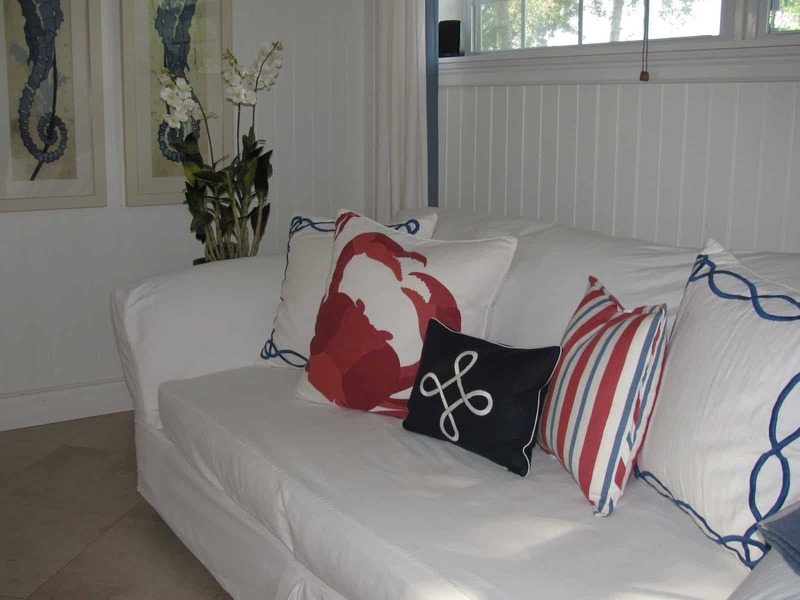 Love your nautical pillows. This pillows series has been so much fun! It's always great to see the variety out there and how the colors and textures work to really make a room. Thanks for sharing. What a beautiful post. I too love Desiree and her beautiful take on elegant coastal living. That first picture is STUNNING…then love all the white wtih accents of blue in her home home and all those blue and white pillows make my heart sing. Cococozys are so fresh and crisp, they are perfect for a beach house or coastal home. 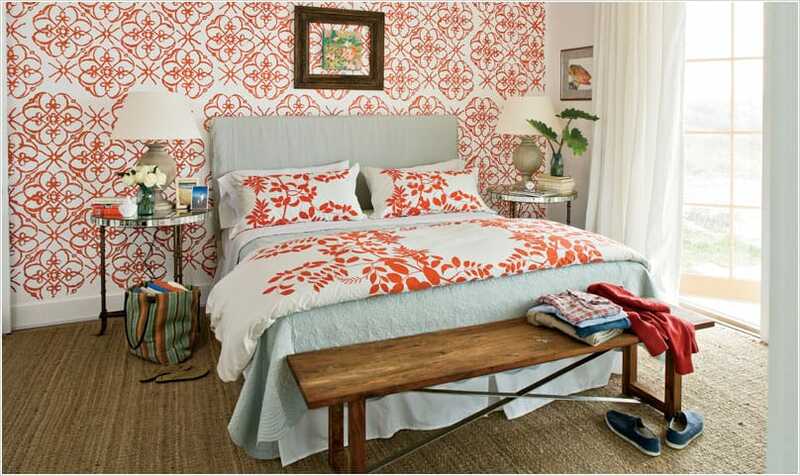 So agree that pillows can so easily transform a cold sterile space into a warm and inviting one. Great post girls! Thank you Mary Ann for including me in this totally fun series and thank you ladies for the sweet comments! I'm glad I'm not alone in my pillow love life! I am so glade i found your blog! Love all the blue and white pillows. I am a pillow person. I always have to have pillows every where. They bring a room together. *** Hi, Mary Ann~ THANK YOU for such a FUN n'a DEEEELIGHTFUL way to start a Saturday morning!!! I 'm one of those who always wakes up "cheerful", but if I EVER woke up "grumpy", one glance at these beauties would be all it takes to make me SMILE big n' bright!!! I SOOOO love visiting you here~~~ and THANKS to ALL the gals for sharing!!! 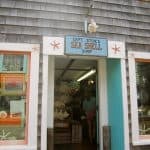 I love this series and I love anything beachy–great post! BTW: loving your new header!! You're right in being sooo in love with pillows. They're great room enhancers and easy to source, make custom, and design around. Inexpensive or high end they are magical room makers. I've made lots of pillows and the smallest amount of fabulous fabric can be transformed into a great pillow or the center of a bigger pillow. Beautiful colorful header, love all the pillows here especially the blue and white pillows. Great series on pillows and the important parts of pillows would be another great post too. Count me into "the pillow club" love love pillows too. Love the John Robshaw pillows. I have a bad pillow obsession, too! I too have a slight obsession with pillows. When I get tired of one, I usually recover it with a different fabric. That way I don't have stacks and stacks of 'em in storage. I also buy pillows at the PB outlet that are a good size but maybe not my taste and have them recovered. Saves me money and I get exactly the look I'm going for. Btw, love your new header! HI Mary Ann! Oh, I love pillows and always need a few more! 😉 Love all of your snaps and that little crab pillow is a hoot! Maryann, gave you an award today..stop by on my Sunday post to see…. Ooh love all these pillow choices! We just bought a few pillow covers in Cambodia and are happy to redecorate with them. Hope the baking turned out well this weekend! Pillows in a room are like clouds in the sky. Yes, pillows are a great and easy way to add a pop of color and pattern. And so easy to change them with the seasons as well!! Pillows make me happy! Love all these pretty pillow pictures. By the way, I bought the whale pillow from West Elm and it's so pretty in person. Adore you new blog header, by the way! Very casual chic! Mary Ann, I love the nautical pillows and the ones in blue. Two years ago I had a designer tell me blue was so "out" in home decor when she saw the pillows in our beach house. Fuuny, because you can't pick up a magazine now without seeing some gorgeous shade of blue. I am loving the Pillow Addict series. loving the navy + gray tim clarke designed room. so pretty and classic!! Love the tropical pillow punch in that first image. My husband would argue that I am the Imelda Marcos of pillows. Great round-up! I love pillows and really love putting together mixtures of patterns and colors that compliment one another. Great assortment here!